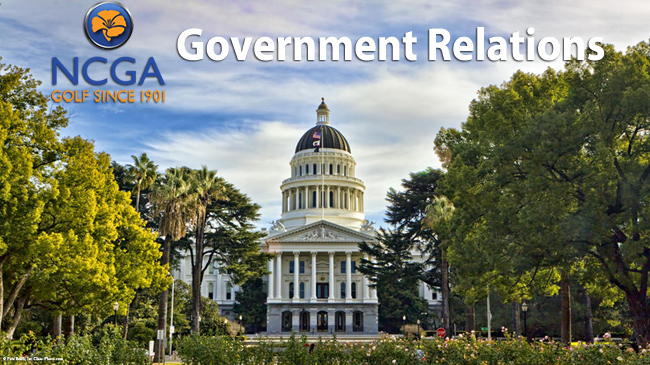 The NCGA actively advocates on relevant policy issues by engaging responsibly with government officials, local and regional conservation groups, public commissions and committees. One of the most valued and least recognized roles of the Association is to be your voice in golf as the industry faces challenges relating to the proposed bills to tax golf. The NCGA, along with the SCGA and the SCPGA, share the yearly expense of hiring a lobbyist to watch the actions taken at the state level that could impact golfers. In 2009, a bill was introduced that proposed a 10% tax on all things golf (membership initiation fees, monthly dues, green fees, cart fees, lessons, etc.). The NCGA — along with the NCPGA and many other allied associations — rallied hard to raise funds to fight the bill, and managed to win the battle that would have cost every golfer in California thousands of dollars in increased fees. Tax initiatives will not go away, and we continue to monitor this closely on golfers’ behalf. Service Tax – Defeated as a leaden trial balloon a few years ago, the notion of taxing services continues to percolate throughout the California body politic. The “Think Long Committee for California,” a group of some of the state’s most influential political and financial leaders, is preparing to launch a $20 million initiative campaign in November 2012 that would create a 5% tax on all services except health and education. It is packaged in conjunction with a lowering of the overall sales tax rate, a lowering of certain income tax rates and the creation of new middle class tax exemptions. Additionally, it would create mechanisms to guarantee that the roughly $10 billion new revenues generated by what the “Think Long Committee” calls a more “equitable and sustainable” tax structure be dedicated to funding education, local government, the pay down of current debt, and the creation of a “rainy day” reserve fund. Crafted in this manner, it promises to resonate with the electorate. But the impact of adding 5% to every golf transaction, whether at the local muni or the private country club, promises to be burdensome to a game already reeling in the current economy. Water – Mother Nature has been kind in recent months; reservoirs are full, and last year’s Sierra snowpack was bountiful. But we live in the arid Southwest, where drought is a recurring condition. Throw in ever increasing population, and the result is the need for permanent vigilance – not to mention a state mandated requirement to lower water usage no less than 20% by 2020. The golf industry must adapt, and adapt fast, or suffer. Just as Alice discovered in “Wonderland” that she had found a place where you must go faster and faster to get nowhere, the golf industry in California finds itself in a place where it must use less and less water just to keep its doors open. Decline – Golf’s popularity peaked in 1999 and has declined every year since, a decline exacerbated by the recent financial meltdown. Because so much of a golf course’s budget is composed of fixed and constantly rising water and energy expenditures, the industry does not have as many cost lowering tools in its arsenal as other suffering industries. Golf is an industry wholly dependent upon discretionary incomes and equities for its sustenance. A higher priced product in a market filled with persons whose pockets don’t go as deep as they used to – not exactly a recipe for success. What can golfers do to help the health of the game? Why does golf need a voice in the state’s legislative bodies and government agencies? In the political realm, those not seated around the table are usually on the menu. It was no accident that when the previous Governor decided to broach the subject of service taxes, he targeted only a handful of activities, among them golf. They all had one thing in common – they were perceived as politically weak. Governor Schwarzenegger did us a favor though. The state’s major golf organizations understood that unless they coalesced around building a “California Alliance for Golf” (CAG) capable of providing a palpable Sacramento presence, the game would continue to get pummeled in the political arena. Whether Los Angeles Water & Power, the California Fish & Game Commission, or the State Legislature, we’re now getting recognized as a presence to be reckoned with – even getting seats around some of those tables. An environmental group invoked the Endangered Species Act in a federal lawsuit that looked to close Sharp Park GC in Pacifica. The lawsuit was dismissed in December. Learn more. We are happy to report that Federal Court Judge Susan Illston dismissed the case against Sharp Park last December. Based on scientific evidence, the judge determined that the practices of maintaining a golf course did not adversely affect the life of the red legged frog, an endangered species. This lawsuit, filed by the Center for Biological Diversity, was a potential landmark case that could have impacted the maintenance practices of any golf course that provides habitat for endangered species. The golf community is indebted to the passionate an dedicated work by the San Francisco Public Golf Alliance which represented the many golfers who play the Alister MacKenzie-designed Sharp Park. The city of San Francisco is also to be commended for defending the suit and protecting the course. A proposed 5% tax for every golf transaction (greens fees; club dues; club assessments; cart rental fees; range buckets) was tabled when California Governor Jerry Brown sponsored his own November tax initiative in 2012, one that would raise the sales tax rate 0.5% and the income tax rate 2% on the highest marginal bracket. The California Alliance for Golf commissioned Golf 20/20 to conduct an Economic Impact Study for the State of California with an comprehensive environmental component. Read the full report here. Other state and regional golf associations from throughout the U.S. dedicated to golf’s growth and preservation. The California Alliance for Golf (CAG) is a non-profit corporation which serves as the unified voice for the golf industry. It’s an umbrella trade organization spanning the state in its effort to protect and promote the golf industry. The Audubon Cooperative Sanctuary Program for Golf is an award winning education and certification program that helps golf courses protect our environment and preserve the natural heritage of the game of golf. Founded in 1955 as the GCSAA Scholarship & Research Fund for the Golf Course Superintendents Association of America, the EIFG serves as the association’s philanthropic organization. The SF Public Golf Alliance preserves affordable, eco-friendly golf in San Francisco for future generations of golfers by ensuring that Sharp Park and Lincoln Park golf courses remain open for play. Its purpose is to research and educate the public about recreational facilities, specifically about the beneficial aspects of San Francisco’s endangered municipal golf courses. It collects, analyzes and provides historical, cultural, recreational, financial and community data to the public, media and key policy decision makers.